Patrons of the Festival Mediterranea this year are being offered an unusual theatrical experience with the staging of Oscar Wilde's celebrated work De Profundis. Written over three months in 1897 towards the end of Wilde's prison term, the 50,000-word letter to his friend Lord Alfred Douglas is not only an autobiographical and self-critical appraisal of their relationship but also a record of his spiritual journey towards self-realization and humility. Covering a range of themes such as art, fame, religion, guilt and justice, he explores in particular the experience of suffering and reveals how it has helped him to see the world so differently and much more truthfully from what he knew before his incarceration. Director George Mizzi – no novice to risk-taking – has adapted the text into a dramatic monologue performed by four actors and integrated with dance and music. 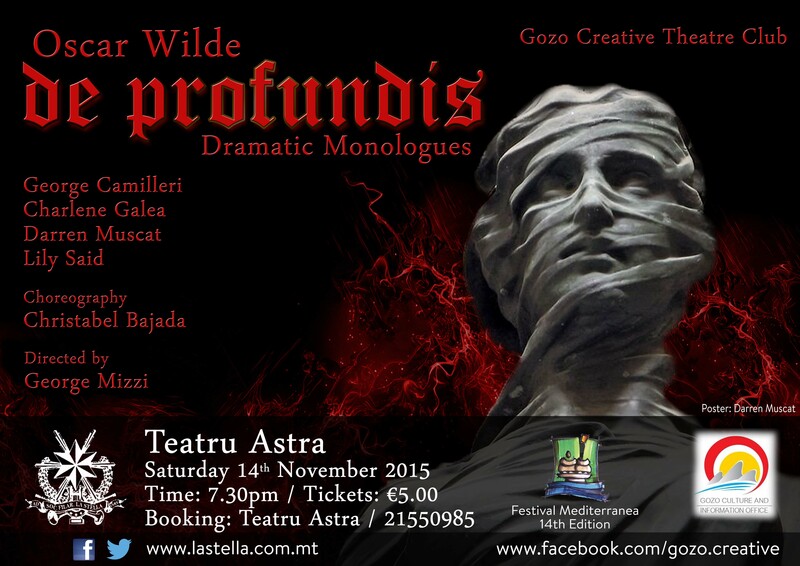 It will be the first time De Profundis has been staged in Malta, a feather in the cap for this collaborative project between the Gozo Creative Theatre Club and Teatru Astra. The performance takes place on Saturday 14th November at 7.30pm. Tickets at €5 from Teatru Astra, tel. 21550985.